Though she is a relative newcomer to the esthetics industry, Carmen Anuriw, CEO of Skin Fairy Clinic, has already garnered a reputation as a multitalented dermal therapist. In 2010, Anuriw received her Advanced Diploma of Cosmetic Dermal Science at the Australasian Academy of Cosmetic Dermal Science (AACDS). In 2016, Anuriw received the “Western Australia Therapist of the Year” award by Danné Montague-King, founder of DMK. In April, Anuriw added two more awards to her roster at The Skin Games, a year-long competition for estheticians, which culminates with an award ceremony and expo in San Francisco. 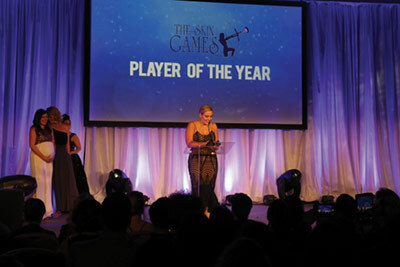 Anuriw took first place in the acne category as well as the coveted “Player of the Year” award. Skin Inc. caught up with the very busy Anuriw to discuss her passion for esthetics and of course, The Skin Games. Carmen Anuriw (CA): Starting at the age of 16, I worked at a local beauty salon Thursday nights and Saturdays, for two years until I could go to beauty school. Straight from high school I went to the International School of Beauty Therapy in Perth, where I studied for a year for my international qualification as a beauty therapist, achieving the CIDESCO diploma by the end. I then headed overseas the following year and worked for Steiner onboard a luxury cruise ship before returning home, which is when I enrolled into AACDS. CA: My parents are my greatest mentors. They have guided and pushed me with nothing but love and positivity from the beginning of my career 13 years ago. “You can do it,” “you inspire me,” “don’t stop,” “you can do whatever you put your mind to,” are all the things they still say to me to this day. The greatest gift they ever gave me was they believed in me, and in turn, I know whole-heartedly to always believe in myself. CA: Opening my first clinic in 2015. It was a dream of mine from the age of 13. CA: You are your only limitation. CA: Get your head into books, training manuals and online education when and wherever you can. Knowledge is power. If you want to be great at any area in the beauty industry, work on mastering your art of brows, skin, waxing, laser...whatever it may be. Learning never ends, and it’s amazing. The growth you can have as a person and therapist is ever-changing. out. Give them growth and opportunity within your business to grow with you. CA: Open your business sooner! SI: Where do you see the future of the esthetic industry? CA: Oh this topic excites me! This industry is just going to get better. All I will say is stem cells! SI: What made you decide to become a player in The Skin Games? CA: I initially was told about it via @Thebeautybuster, Lora Condon, who is in New York City. She private messaged me on Instagram and said, “Why don’t you enter this because you will probably win; you do this every day.” I jumped on, had a little look and I was hooked! SI: How was the experience for you overall? CA: Changing peoples lives is amazing. Skin is such a sensitive subject and affects people to their core, especially acne. I chose Lucie, who was a client already, to be my model. She was two treatments in, and we began the journey together—eight weeks of treatments. The Skin Games came to life! SI: What do you enjoy most about esthetics? CA: I enjoy helping people, making them feel better about themselves...the entire journey. Holding their hand, guiding them, feeling the emotions with them, and the challenge of trying to clear their acne and give them their confidence back.